Sojourner Truth helped blacks escape to freedom on the Underground Railroad after moving to Battle Creek in 1857. February is Black History Month—an occasion to single out and honor black citizens who have made lasting and positive contributions to American society. Such a person was Sojourner Truth (1797-1883), a heroic black woman who worked against slavery in states from Maine to Kansas. She spent her last years in Battle Creek, Michigan, and her life is a study in how black and white Americans worked together for a more free and just society. Born a slave in Ulster County, New York, Sojourner Truth actually grew up with a different name: Isabella. In her youth, she had several masters, one of whom beat her and scarred her for life. She grew tall, almost six feet in height, and strong; she was allowed to marry and had four children. In 1826, when her master John Dumont reneged on a promise to free her, Isabella ran away and began work for the Van Wagenens, a nearby Quaker family. When the angry Dumont found her, the Van Wagenens paid him $20 and secured her freedom. The friendliness of the Van Wagenens helped Isabella learn that white people, like blacks, could be either friends or foes. More lessons of this kind would come quickly. In 1827, New York abolished slavery, but John Dumont sold Isabella’s son Peter to a family in Alabama. When Isabella protested this sale, two white lawyers in New York gave her free legal help and liberated Peter through the courts. Isabella became fascinated by the notion that black and white could work together to fulfill the goals of the Declaration of Independence—the right to life, liberty, and the pursuit of happiness for all Americans. 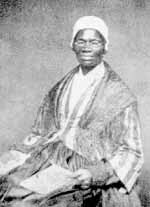 In her middle age, Isabella changed her name to Sojourner Truth and worked with whites and blacks all over the country to abolish slavery. She moved to Battle Creek, Michigan, in 1857 and soon became active there helping blacks escape to freedom on the Underground Railroad. She never learned to read or write, but a white friend helped her tell her life story in Narrative of Sojourner Truth, which sold widely to readers throughout the North. taught a message of freedom for blacks mingled with forgiveness—not hatred or violence—toward whites. Frederick Douglass, the famous ex-slave, praised her as "honest, industrious, and amiable" as well as "remarkable" for her "independence and courageous self-assertion." Harriet Beecher Stowe, the author of Uncle Tom’s Cabin, called Sojourner a "shrewd" woman with more "personal presence" than anyone she had ever known. During the Civil War, Sojourner even had a cordial meeting with President Abraham Lincoln: She called him a "Daniel in the lions’ den" fighting to secure liberty and justice for all citizens. When the Civil War ended, and slavery with it, Sojourner Truth moved to Washington, D.C. for three years to join the Freedmen’s Bureau, which was created to help blacks adjust to and protect their new freedoms. She protested segregation—especially old laws that kept blacks from riding streetcars. She was influential in changing those laws to integrate the streetcars in the nation’s capital before moving back to Battle Creek. Sojourner insisted that blacks use their freedom in responsible ways. She stressed the need for blacks to be industrious and prove their value to society. In a speech at a temporary relief camp, she criticized those blacks who were living "off the government." "Get off the government and take care of [your]selves" she urged them. She was especially critical of those blacks who one week would take charity boxes of clothes, sent by Northern whites to Washington, and then the next week would return to "grab" more. Such behavior, she insisted, made blacks "worse off . . . than in slavery." Sojourner Truth helped pave the way for Booker T. Washington, who practiced what she preached and started Tuskegee Institute in Alabama to help blacks develop their skills for America’s industrial society. The opportunities that freedom brings, not special privileges or government handouts, were what she wanted for blacks after the Civil War. The life of Sojourner Truth—from slave, to author, to acclaimed public speaker, to defender of liberty with responsibility—was truly a sojourn to find the truth. And in the process she joined with whites and other blacks to make America a freer country for all citizens.